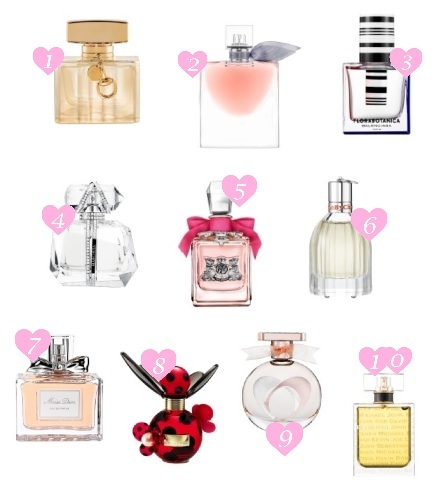 Check out these irresistible, Valentine's Day fragrance picks at Sephora. Find your signature scent with a complimentary fragrance consultation at Sephora on February 8-10th or February 13-14th. Receive an exclusive Sephora bag and fragrance samples with your consultation. Click here for event locations and times or to find your nearest Sephora. 1) Première by GUCCI, $87 - Complete with notes of Bergamot, Orange Blossom, White Flower, Musk, Leather and Wood. 2) Lancome La Vie Est Belle, $75 - Featuring the most precious natural ingredients, including Iris, Patchouli and Gourmand. 3) BALENCIAGA Florabotanica, $95 - Designed with the charm and mystery of unknown flowers from a secret garden. 4) MARCHESA PARFUM D'EXTASE, $85 - This fragrance opens with light florals, giving way to a combination of fresh and woody notes that create complexity and beauty. 5) Juicy Couture La La, $70 - A blend of bright sparkling mandarin with bold white florals. 7) Dior Miss Dior, $90 - Inspired by love and romance, this fragrance features a blend of Italian Mandarin Essence, Egyptian Jasmine Absolute and Indonesian Patchouli Essence. 8) Marc Jacobs Dot, $69 - Feminine and chic, this scent offers a blend of Red Berries, Jasmine, Vanilla and Musk to create an uplifting and delightful aroma. 9) Coach Love, $72 - Cozy fragrance that blends both woodsy and florals to create a scent that is modern, enviable, and chic. 10) Boyfriend, $65 - Featuring a balance of vanilla, jasmine blossoms, and an accord of amber, this scent evokes the memories of that time after he has left for the day.